If your parents were lost in a Storm, the Old Family Friend who served with your Parents long ago is Milo Graytail. He becomes part of your crew with the FrogFather’s blessing and will help you guide your new ship that you pick up in Jonah Town. 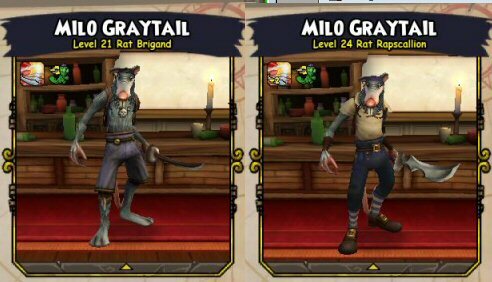 When you first meet Milo he is a Swashbuckler Rat Brigand. You can learn much more about his abilities and skills from Pirate101 Central. As you level up your companions they will occasionally reach epic promotion opportunities. Milo’s first epic promotion occurs when he is promoted to Level 21. After you applied training points and he reaches this level, he’ll tell you he needs to speak with you. Let’s go to a nearby Tavern so you can talk. In the Tavern he’ll tell you “Captain, listen to this! Tom Tinkney, old friend of mine, just sent a letter. Seems he needs help getting his new business of the ground. Tom wants to be a Yum bottler! He says he has some secret process that’s going to let him out produce all his rivals!”. This quest will require you to have access to Cool Ranch. 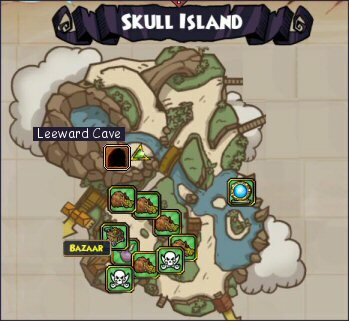 Back on Skull Island you’ll find Leeward Cave up on the mountain on the far side of the waterfall that looks over Avery’s Shopping area. But in the cave what you’ll find is trouble. Seems Tom has been captured by some Crab brutes and you’ll have to help set him free. Once you do, Tom will tell you he’s ready to move all his materials to his Warehouse in Skull Island Town. He has his yum-yum fruit, molasses, but his mixing vats have become all slimy because of the blasted Crabs and their stew. Head off to Monquista and pick up some jellyfish acid. You’ll need 8 of them, but it shouldn’t be that hard. You’re a lot more powerful than you were last time you took on the jelly fish. Once you have them, head back to Skull Island and find Tom in his warehouse. Tom’s Warehouse is behind The Kraken Skull Tavern. Head on back there and Tom will thank you for that little quest. But he’ll ask if you could run over to talk to Lucius Fox in Jonah Town who drew up plans for a Yum-Yum Juicer. He was making the machine and it should be done by now. Can you bring it back. Lucious Fox explains Tom purchased a machine from Mr. Perkins in Cool Ranch. But it hasn’t arrived yet. 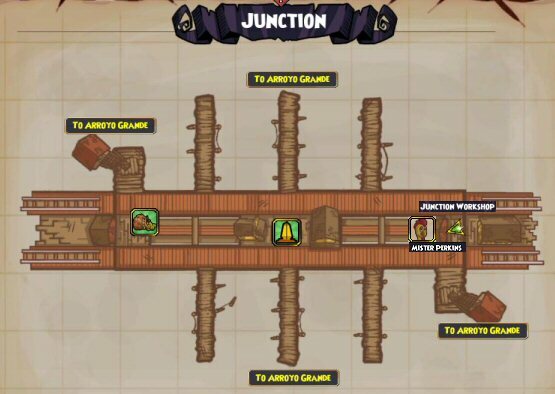 Perhaps since you have a fast ship, you can run over to Junction and find out what the problem is. Take the long trip to Junction and look for Mr. Perkins in his dockside warehouse. Mr. Perkins will tell you he has the machine, but it’s not completed yet. It doesn’t have the Squeezers yet, because…well it’s complicated. He suggests find some grippers from a Mining Machine, but there aren’t any left, that are working anyway. Now you’re off to the Canyon Floor to find the Sandstone Mine where you’ll find an old friend. Monterey Jack. Of course upon seeing you he tells his gang they’ve got a score to settle with you. And the battle begins. Once you dispatch Jack, you can grab the grabbers and head on back to Lucius Fox. He’ll assemble them to his machine and hand it over to you for delivery. You’re almost done with this very long and involved promotion. Back over in Tom’s Warehouse you’ll help him plug it in and start it up. Woohoo, you’ve gone into business with Milo Graytail and Tom Tinkney. Now head off to the tavern to celebrate. The nearest tavern of course is The Kraken Skull Tavern. 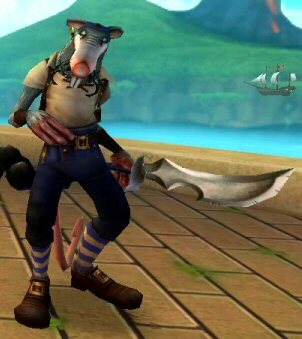 When you apply the promotion, Milo will become a Rat Rapscalion. Milo’s next promotion will come when he reaches level 46. At this level he will take the opportunity to become a Rat Scoundrel. My Milo has a bit farther to go before he reaches this level. But as soon as he does, I’ll update his Quest page. 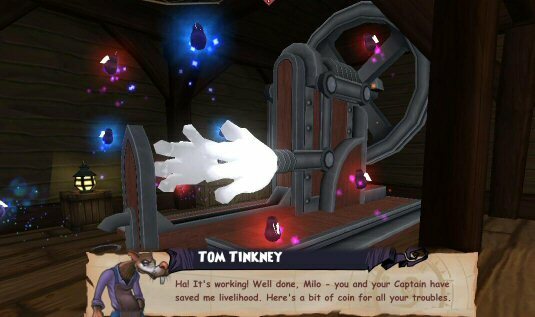 This entry was posted on September 24, 2013, in Game Guides and tagged companion, game guides, game hints, games, Kid friendly, kid safe, locations, milo, online, Pirate101, Pirates, promotion, quests, role play, Skyways, spells, Windlanes. Bookmark the permalink.